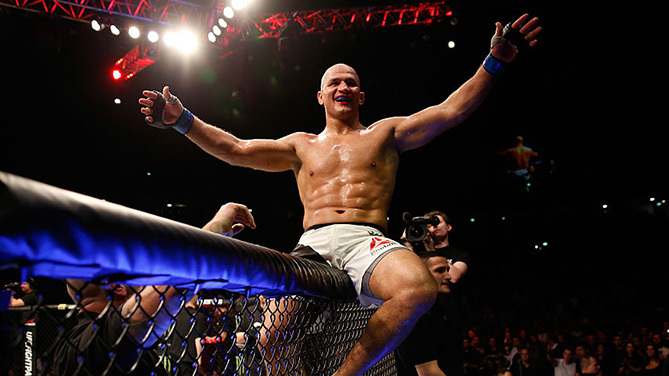 Junior Dos Santos looks like one of those people who would be good at anything he tries. And in the time since his last bout against Stipe Miocic in May 2017, the former heavyweight champion has become quite the diaper changer for his son, Bento. Spending time with 16-month-old Bento and his wife Isadora was the bright spot of a rough post-Miocic stretch that saw Dos Santos flagged for a USADA violation and put him on the shelf. But the megawatt smile that has become almost as much a part of “Cigano” as his punching power returned in April when it was determined that Dos Santos, along with fellow UFC fighters Rogerio Nogueira and Marcos Rogerio de Lima, had used contaminated supplements and did not knowingly take banned substances. Just like that, Dos Santos could breathe again. And the fans that supported him and said, “Not Junior” when the news of the positive test first broke, could do the same. That support meant a lot to JDS. All the while, Dos Santos stayed in the gym, waiting for the day when he would be cleared to return to the Octagon, refusing to think of any other outcome to his case. This Saturday, Dos Santos returns for a main event in Boise against Octagon newcomer Blagoy Ivanov, long considered to be one of the best heavyweights not signed to the UFC. Ivanov is a tough out, but it could have King Kong and Godzilla on the same night and Dos Santos would have taken the fight. And though he’s alternated wins and losses in seven bouts since 2012, he doesn’t feel that a benefit of the time away was giving his body a rest from the rigors of being one of the top big men in the game. Dos Santos has always seen the positive side, and we can see it on his face. There’s a joy surrounding him that only leaves when it’s time for him to put his mouthpiece in and fight, and having him back in the Octagon is a good thing not just for the sport in general, but the heavyweight division in particular. I ask Dos Santos, who held the crown from November 2011 to December 2012, if he liked being that target. He wants to get back to that place as soon as possible. But before looking forward, I want to look back once more and wonder who was more excited when his return was announced – Dos Santos or the fans?